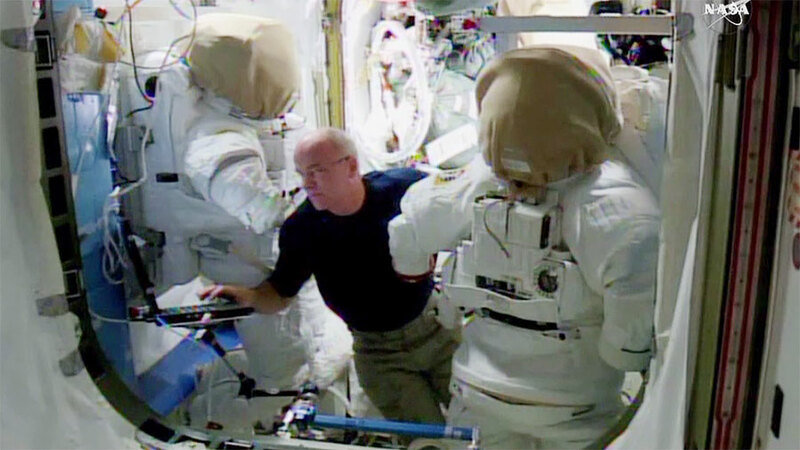 Commander Jeff Williams continued the ongoing maintenance on U.S. spacesuits throughout the workday on Wednesday. Meanwhile, the Cygnus cargo craft from Orbital ATK re-entered the Earth’s atmosphere completing one final experiment. Williams scrubbed cooling loops and collected water samples from inside U.S. spacesuits ahead of a pair of spacewalks planned for later this year. The main task planned for the first spacewalk will be installing an international docking adapter to the Harmony module. The second spacewalk will see the replacement of batteries as part of maintenance for the International Space Station’s power system. Cygnus has been busy since its release from the station June 14 serving as a platform for science. Its first experiment saw a large fire set inside the vehicle helping scientists understand combustion in space. Earlier this week, a set of nanosatellites was released from Cygnus. Finally, as Cygnus broke apart during its re-entry recorders downlinked data providing insights into the behavior of spacecraft re-entering Earth’s atmosphere. Thank you so much for your update…..Your assignments are very interesting. I so admire your wisdom ,tenacity, spiritualism and perfectionism…and of course your bravery. I have my grandsons enrolled in the Structural Engineering Program at NASA this week. They did the Robotics Program over Spring Break . I still teach school (actually a retired teacher) but do a lot of long term subbing…I generally bring up the Space Program and of course the ISS…so many students have no knowledge of what is going on at NASA and the ISS and many adults as well….That is difficult for me to fathom. I so remember John Glen’s first space flight….and that stimulated my interest in space flight…… Thank you and God’s Speed for all you ladies and gentleman… You all are First Class!! !